Supplied as a pack of 6 top quality rhizomes, 2 each of Stitched Beauty, Crinoline and Colette Thuillette. 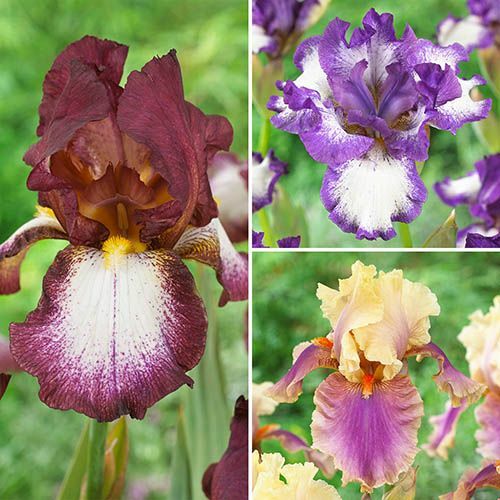 These bold coloured, exotic looking members of the Iris family provide perfect early summer displays. Taking their name from the shape of the bold blooms, they are incredibly winter hardy coming back year after year and will thrive in any fertile, sunny border. For best results, plant with the top of the rhizomes just above soil level, where the sun will bake them and ensure a perfect flowering display! Each collection contains 2 top quality rhizomes each of Stitched Beauty, Crinoline and Colette Thuillette. Supplied as a set of 6 rhizomes - two each of the following varieties; Touch Of Spring, Crinoline and Colette Thuillette.